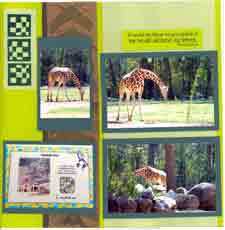 A Zoo Scrapbook Layout for that Zoo Trip? or maybe even A Vacation to Africa? 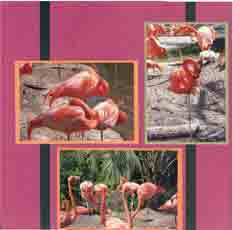 All you need for doing those Special Trips to the Zoo Scrapbook Layouts or maybe even a whole themed scrapbook for your Africa Scrapbook Layouts is some paper that reflects the natural Zoo or African environment. The Colors of Browns and Greens with maybe some blues along the way to show off the natural habitat of the animals - the earthly colors of grasslands or woodlands or the African Savannah. Through in a few fibers or ribbon with the same colors to embellish your pages. 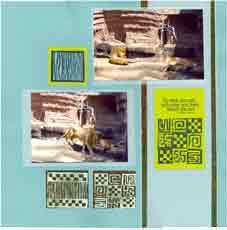 Then add in a few other images from some rubber stamps to represent the animals you have photographed or maybe some African symbols or colorful images. I need to confess almost all of the items used on these following layouts were from a Kit from Club Scrap. Since I am a member of Club Scrap, I had the benefit here of a monthly kit of coordinated papers, stamps, images and ribbons that were perfect for African of Zoo Scrapbook Layouts. This was the Serengeti Kit for November 2007. 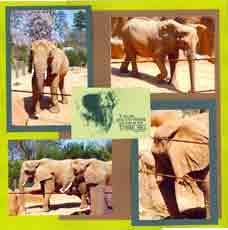 Check out some of these Zoo Scrapbook Layouts which could also be used for African Layouts. For this 2-page spread of Zoo Scrapbook Layouts, there's no title for the Elephant Layouts, but instead on the left page a graphic picture of an Elephant with a saying "If you are going to be thinking, think Big" a Donald Trump quote. The card with the picture and the quote has been placed in the center, and actually covers up some of the photos where they are drab and uninteresting. This layout of 4 photos, includes 2 4 x 6 photos horizontal in opposing corners, and 2 vertical photos in the other corners. This is a great way to get 4 photos on a page. 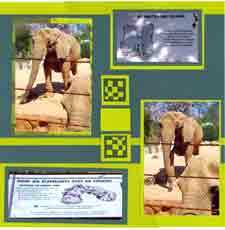 On the right page, there are photos of 2 signs that were in the Pachyderms area. One sign included detail of how the Elephants stay in touch with one another. 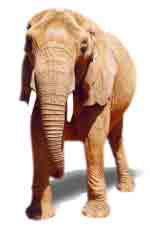 The other explained about why Elephants have such big ears. This layout, also of 4 photos, is essentially the same arrangement as the left page, but the photos of the signs have been cropped to show only the sign itself, thus giving a little more room for the center embellishments. A good time to try cropping your photos. 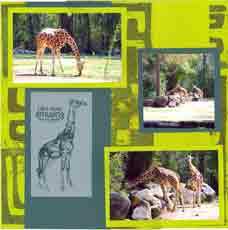 The Zoo Scrapbook Layouts for the Giraffe also have no title, but again using the Giraffe image with a quote from Andrew Lang, "Life's more amusing that we thought." One would think as long as I have been scrapbooking and taking photographs that for this subject particularly, I would have a bunch of those tall vertical photos, but they were all horizontal. A really bad case of "horizontal-itis." So on the left hand page, I severly cropped a horizontal 4 x 6 photo to eliminate the green space on the right and left and made it a tall photo that was very narrow. Again, there was another sign photo explaining about the Giraffe that I was able to crop to fit 4 photos on the page. The right hand page was done essentially the same, with one cropped photo and the tall graphic of the giraffe - again fitting in 4 matted images and leaving a little room for some journaling and embellishments. 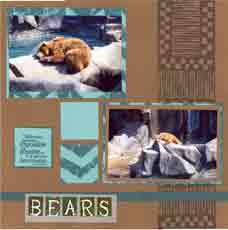 This 2-page Zoo Scrapbook Layout, actually has a title, "Bears" and while not too original or creative, it does get the point across. I like to title my layouts in some way, and since I had no graphic or rubber stamp image, I used some individual letters that matched the colors of the papers. The letters were put on a small piece of vellum, aligned with a small space between each letter. The vellum was trimmed afterwards to center the lettering, title or journal block. The left hand page uses 5 photos, with three of them trimmed to allow them to fit onto the page. Again 2 more photos of signs that we found in the area of the bears - easy photos to crop. The right hand page only has 2 photos and I thought that would even things out and leave more room for decorative background paper and embellishments. 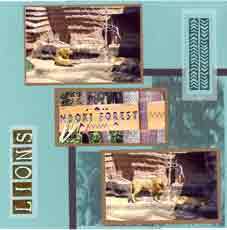 For the mighty Lions Zoo Scrapbook Layouts, we only had 4 photos of the lions so both of these pages have a lot of design in the paper and a number of embellishments. For the left hand page, using an additional cropped photo of the sign in the middle, cropped only from the top and bottom, centered between the un-cropped photos like stair steps on the page. Since there was no room for even the small title to be placed horizontally, it is put up and down and then the layout is balanced on the other side with a decorative embellishment. The lettering for the "Lions" title was made the same way as the "Bears" title. The right hand page is similar in the photo placement, with two horizontal photos stair-stepped on the page. Blank space is take up with some extra embellishments. 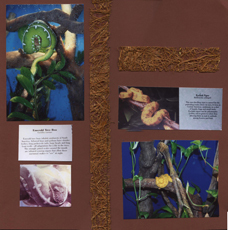 Both Zoo Scrapbook Layout pages use a dark green grosgrain ribbon to separate the background papers that are pieced together - and to cover the seams. This layout is a little busy for my taste, but sometimes that happens. I may remove one or two of the embellishments to calm it down a little, but I will need to think about it for a while. 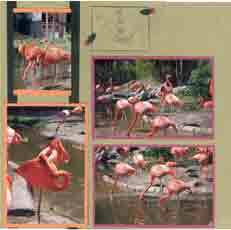 These two Zoo or African Scrapbook layouts both use Ribbons to highlight parts of the layouts with the stunning Flamingos. The right hand page carries the ribbon to accent or border the photo in the upper corner. 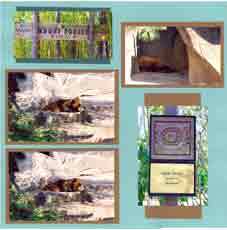 These two Zoo or African Scrapbook layouts both use matted photos that overlap one another. 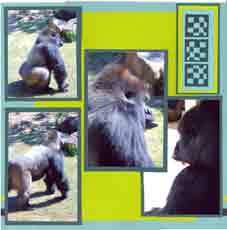 On the left hand page, the one profile shot of the Gorilla had a lot of white space on one side that I couldn't crop out without taking off some of the Gorilla. The other profile shot at least had some grass and coloring so I just overlapped the better photo over the white space of the other. I did not glue the matte down to the front of the photo underneath, just around it. I used the same technique on the right hand page which shows the animals long tail from 2 different angles. The Tag on the left side says "As is a tale, so is life. Not how long it is, but how good it is, is what matters" by Seneca. I thought the quote was a cute play on the words tail and tale. 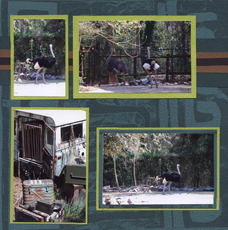 Unfortunately we could only get one photo of the Zebra, but these two layouts combine the one photo with several photos of the poachers camp and the Ostrich to make a two-page layout. The matting on each page is the same color, with a complimentary color used on the opposing page. 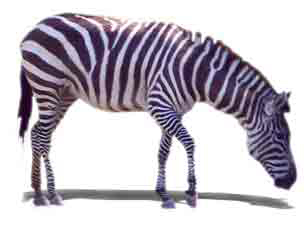 The more important photos of the Zebra and Ostrich are double matted for emphasis. The journaling tag says "Do what you can with what you have, where you are. - Theodore Roosevelt"
The little tags on the bottom corner spell out WILD. Each one is attached with a teal brad to match the background teal paper. 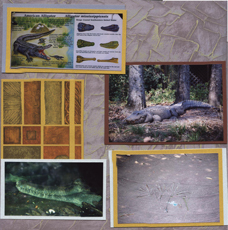 The background paper on the left page with the Alligators is very heavily textured and actually resembles the texture of the alligators and the gray color is similar to the colors in 2 of the photos. 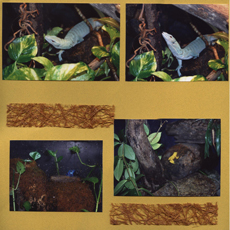 The photos in the right page of the Iguanas also have the gray and the golden brown, so I put these two colors together with opposing background colors. 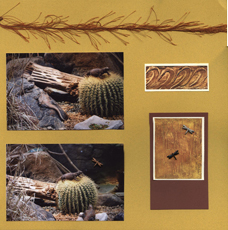 To add some texture to this page the brown eyelash ribbon to reflect the spiney cactus in the photos and tags using the textured paper from the left side, but in the golden brown colors. 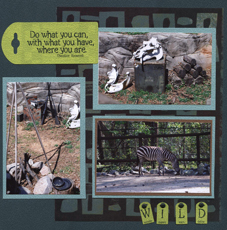 Both of these Zoo Scrapbook layouts are very simple, using no mattes and only strips of very textured fibrous "paper" to accent some blank areas of the layouts. 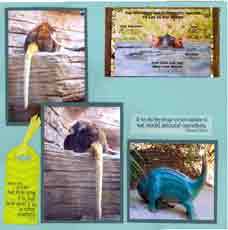 We hope you have enjoyed our Zoo Scrapbook and plan to make your own very soon.